I can now tell you about another project that I've been working on...I made a scarf in Tunisian Knit Stitch using Red Heart Stripes yarn. This project is for a raffle in the "RA_Yarnsandmore group"
The design was first worked in Red Heart Stripes in Breezy, a nice self-striping in white, blue & lime green; very summery. This scarf was given at the gift exchange at the Chain Link Conference. 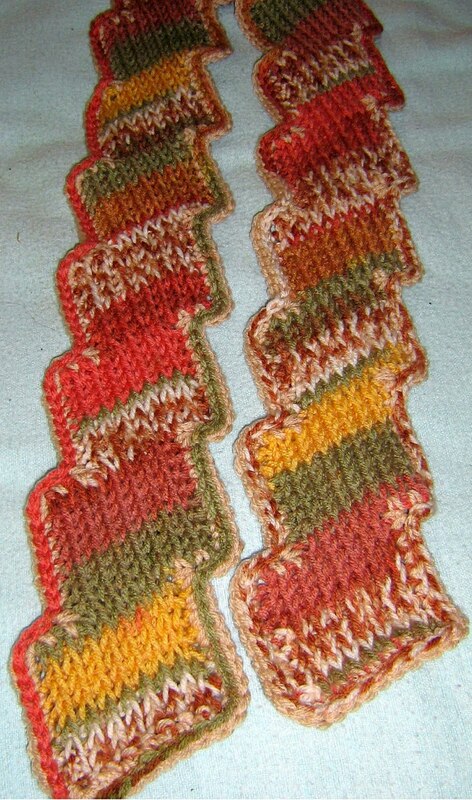 Then I worked up the design in RH Sonoma Stripes - tan, brown, gold and orange. Definitely autumn colors. I worked a round of single crochet in tan, and then a round of reverse slip stitch in the Sonoma Stripes. 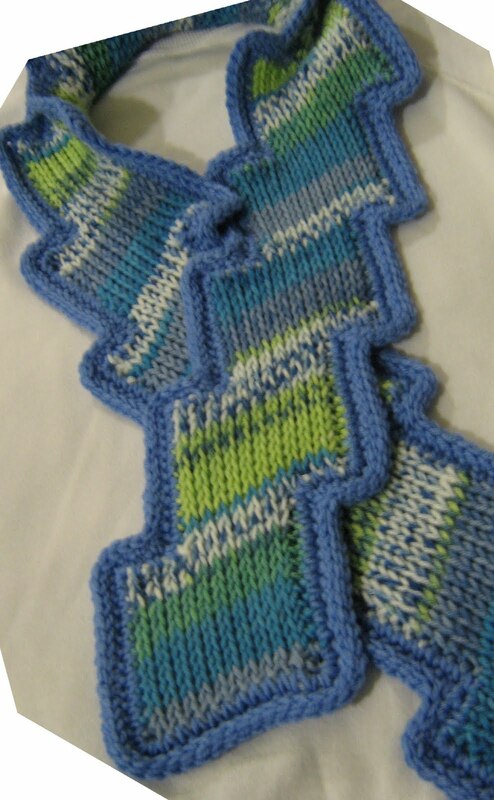 This scarf was raffled in the RA_Yarnsandmore group, as a way to generate interest in new yarns. I can finally tell you a little about a project which has been taking up some of my spare time...The CGOA has created a book of patterns from members of the Board of Directors. We each designed a project and wrote the pattern, which then went to editors. After the projects were finished, we each sent our project off to Cari Clement at Caron, where they were professionally photographed. That had me very excited! I've been very tight-lipped, which is hard for me. I told my Mom that I had a project sent to a professional photo shoot, but no details, even after she emailed and asked for more details. I'll send her an email to check out this blog post. Doesn't that picture look fabulous! I've seen a preview of the full booklet, and it's amazing. If you haven't renewed your membership, or if you've been dragging your feet about joining the CGOA, it's time to join or renew. This fabulous pattern book is only a taste of all the great benefits of the Crochet Guild of America (CGOA)! This is an interesting discussion of the words hank, skein, and ball and how they are used in yarn talk. I love that the author has gone beyond just how he/she uses it, and searches for the history and etymology of the words. Being a word freak, and enjoying searching etymologies, I enjoyed the blog post. But, I've gotten distracted, I was searching for the history of machine-wound, center-pull skeins. Back to researching. Here's a little worksheet that will be a great help in making garments that fit. There's a cut "paper doll" drawing, with dotted lines and numbers for every area that you should measure. Then numbers and labels in a column, and a place for you to write in your numbers. There's even a few blank spaces at the bottom for you to add your own areas, maybe a head circumference for when you create hats. For those of us with extensive garment construction background all the terms should be familiar. For crocheters who don't have a lot of clothing construction experience, they might have to do a little research to know what armhole drop or rise mean, and exactly how to measure for those. I think that I'll print out a few copies and put them into the binder I've created for sweater making. WOW! WOW! WOW! You have to look at these photos. Drew has posted photos of some designs that are in his new book "Crochet It. Love It. Wear It!" And the designs are stunning! If you ever hear someone complain that knitters get gorgeous designs, and crocheters get granny square vests and house accessories, direct them immediately to these photos (and after September to this book!). Classic, elegant, chic, designer styles. A little black dress with a sweetheart neckline, a floor-length coat with faux fur trim, a pencil skirt, a scoop-necked vest with some fabulous lines,... Must leave this, head to Amazon and put this book on my wish list! I've just been to the preview site of the Summer Interweave Crochet, and I'm eager for the issue to arrive. There are some lovely sweaters, tunics and shawls. Some of my favorites: Midsummer Night's Shawl by Lisa Naskrent, check out the bonus photo and see those lovely flowers; the Cool Waves shawl by Sheryl Means, Tunisian! (bonus points to anyone who can find me that lovely colorway of lace weight yarn with no wool); and several afghan squares - look at that lovely Double Twist by Drew Emborsky, and the Tunisian Cables!! by Angela Grabowski. I started in a Tunisian Cable CAL with Angela's Yahoo group. Lovely, lovely cables with a Tunisian hook. Can't wait to get my hands on this magazine! It's that time of year. The Event packet has arrived for the Chain Link conference. I've printed out the descriptions of each class, the homework to be done before arriving in class, a map of the conference center, etc. I've got my schedule worked out in an Excel Spreadsheet and in a Word document table. I like the table, there's room for notes, like homework for the class, materials fee, teacher's name, classroom; I have complete information for each class, activity and event. But, it is 4 pages long. The spreadsheet is less than a page, it has basic information; such as there's only 1 hour free on Thursday afternoon, get lunch right there; don't forget to go to the Annual meeting, don't miss the fashion show, etc. Yesterday I started getting everything off the computer desk, and into the conference binder. First, I've learned to get at least a 4" binder with the create-a-cover. I usually put my schedule in the front plastic cover, and the map in the back plastic cover, great for a quick glance as you clean up from one class & try to decide if you have time for lunch before the next class or activity. So I stick the schedule in the front, flip the binder over, and there's no cover sleeve on the back. Okay, I decided to slip the map into the pocket on the inside front cover. There's no pocket on the inside front or back cover. Daughter #2 says "Mom, you're flipping out over a binder! Relax, breathe"
Well, I guess I'll live through it,...but who designs a create-a-cover on the front only? Who bought this binder? I'm quite used to having piles of paper on the top of my computer desk, list of things to do, files of things that I'm working on, reminders, crochet patterns, print outs of yarns that I'd like to pet at the lys, etc. Right now the files are piling up. Along with the Conference paperwork, and the normal household notes (grocery list, calendars, reminders of errands); I usually have a pattern that I'm checking, or research on a topic for the CGOA. I'm one of the email correspondents. I also have a folder on the CGOA's Master of Advanced Stitches and Techniques; I've started doing portfolio reviews. Of course, that's not all...I also have 2 binders for the Craft Yarn Council's Certified Instructors Program (CYCA CIP). The swatches are in zip lock bags with an index card, then all the small bags are in a large zip lock. The legal pad with notes is inside one binder, until I get them typed and proof-read. I also have a file for the Knitters' Day Out, I'm teaching a class on Tunisian. The file has email correspondence, contract, lesson plans, scribbled notes to be added to the lesson plan, pattern to be copied and given to students. After the conference, I will finalize the lesson plan, make copies, and organize the swatches and samples which are in a rolling suitcase right now. I have a stack of folders with information on different colleges, a folder with transcript information on colleges that I've attended, and a folder on scholarships. That's right, I don't have enough to do, I'm going back to college to finish that Bachelor's degree. I'm made a general TO DO list on the computer, and I routinely update it & email that to myself. But, I've also created a spreadsheet to help with the push that will come before the Conference. Each night I jot a note about what I've accomplished that day (many days, not enough! ), but I'm hoping that it will help me to keep things in focus. I have emailed my Mom with the instructions that if she doesn't hear from me for a lengthy period, that she should have someone come to the house and move books, folders, patterns, and envelopes and make sure that I'm still alive under all the paperwork. Wow! A summer workshop using fiber techniques including ropemaking and crocheting. If only I had some artistic talent, rather than simply craft level talent, I think this could be a lot of fun. The workshop is the 4th one down, under Fiber and is title: Assembled Lines: Plane, Sculpture, Concept. Wow, what does that title mean? Well, if crocheters don't have yarn at hand, they will crochet with anything. Plarn is yarn that is made of plastic bags. A great way to recycle all those bags that you get from the grocery story, drug store, and everywhere you go, it seems. They don't decompose in a normal lifetime, so throwing them into the trash and landfills means we've got a longtime mess. Reuse those bags, and make other bags. I've got a CGOA Chapter friend who does this, it's fun to tease her about spending time cutting up a dozen or so bags, and taking the time to crochet and then ending up with...only 1 bag! Ahh, but those bags are sturdier, will hold more, and importantly, they're not adding to the massive landfills. The blog entry in the title was written based on another blog, so this story is getting passed along. Be sure to visit the original "bagsbegone" and check out the photos of projects, and the many places she's taught. Very inspiring! By the way, the project can use donations of large crochet hooks, or old toothbrushes which are melted and a hook formed, or just some cash to purchase hooks. A fellow member of our local CGOA Chapter, just started a new blog. I'm going to add her to my "sidebar". Do I remember how to do that? Or do I have to call on daughter #2 again? In the meantime, take a peak at her blog through the above link. I'm already loving that pile of knots on her couch! PS: Our local CGOA Chapter is Those Yarn Crocheters, Harrisburg. Many of us will not see the use of tea cozies, because we don't have a big pot of tea sitting ready to pour anytime we get thirsty. But making a pot of tea is so much easier than making a cup at a time. Now, how do you keep it hot? You crochet or knit a little blanket for the tea pot...to keep it cozy warm. I've seen some really cute ideas. From this grouping, I like the white knitted cozy with the rows of buttons around the bottom. What do you wear to elope? Okay, you're eloping to get married on the top of a California mountain, followed by a trip gold mining in Northern Canada. What do you wear? This creative bride spent 3 weeks crocheting doilies, designed & sewed a dress, sewed the doilies over the dress, attached clip earrings to high heels, and then made her bouquet. She gets super bonus points from me - I've crocheted a lot of doilies. I designed & sewed my own wedding gown, and did most of the sewing on 1 bridesmaid dress (the other ladies each made their own). I've also done some flower arranging, and a lot of cake decorating, including wedding cakes. But to do all of that at the same time. Kudos!! I took a trip to North Carolina at the end of May. I visited with family, and went to my nephew's wedding reception. Had a great trip and good times! Since returning I've been trying to catch up on various projects for the CGOA, National and our local Chapter; a design that will be raffled on RA Yarnsandmore; and I've started the CYCA Certified Instructors Course. 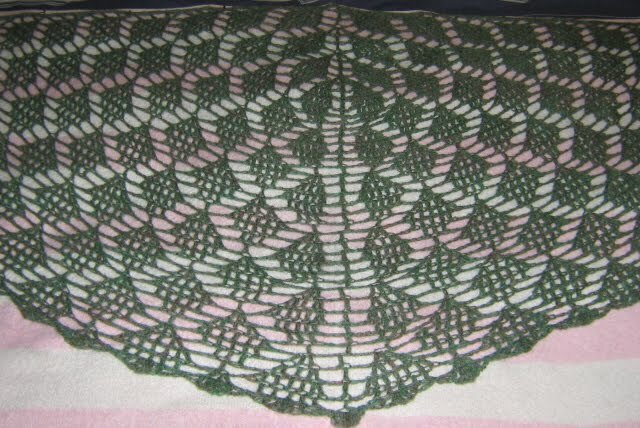 Today, I finally blocked the Lacy Leaves Shawl that I made in April. It's made of a lace weight yarn, and it dried very quickly!